I am 24 years old. 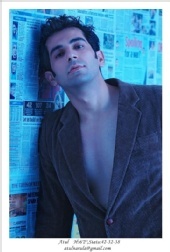 I have been involved in modeling since since last 2 years. I have quite a bit of local modeling experience in fashion show's and photo shoot's. I also have experience in promotional modeling and commercial advertisments for Honda and Microsoft. I have engineering degree also. Currently I am working in IT field and doing modeling . I am very serious and mature about my work. I am always prompt, prepared and professional. I am very dependable, easy to work with . If you feel that I would be a good fit for any upcoming project please, let me know.